The first property I ever bought was back in 2005. It was a little 3-bed terrace in a popular area. It was my introduction to being a landlord but even though the location and tenant profile for the area was great, I was never really prepared for what being a landlord would entail. Now I count myself as a bit of a geek when it comes to admin and I love a good spreadsheet to keep track of things, but being a hands-on landlord and managing tenant needs more than a quick spreadsheet. 12 months later all was well and my sturdy spreadsheet was proving great at ‘tracking’ my rents and all the other important property bits and pieces…. or so I thought. Fast forward another 12 months and my ‘paperwork’ was starting to become a real pain as I had just taken on a couple of new properties. Tracking rents, managing tenant details, keeping posted on gas safety certificate renewal dates, was proving an uphill battle. I knew (even back then) that if I was ever going to scale this thing and be successful full time in property and be a professional, then property portfolio software that could take care of everything for me was urgently needed. After trialling a few options I settled on Ezpz software and haven’t looked back since. It’s been great for me, but I appreciate it can be hard to know if it will be right for you. After all, will it really help you manage ‘your’ properties better? 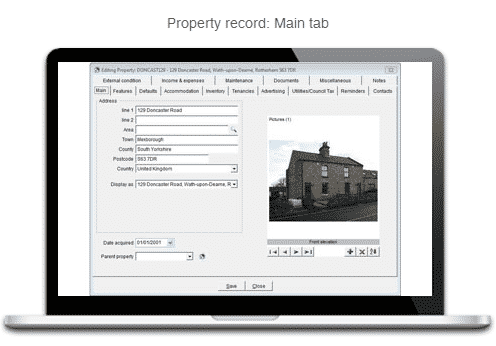 Why do I need software to manage my property portfolio? Possibly the most recognised reason for using software to manage your property portfolio is the fact that it allows you to be better organised by keeping all your information in one place. The above question is seldom asked of me but is often answered by the prospective clients that call us looking for property management software. The caller has usually already decided that they need “some software” because they are struggling to cope with all the scraps of paper notes they have made or with getting their self-created Excel spreadsheet to do their bookkeeping for them. They then realise that there is no need to “re-invent the wheel” as there is plenty of software already available that does the job. What should the software do? Probably one of the most important things you want your software for is accounting. You want to know which of your tenants’ rent is overdue and who has already paid. The software should offer some form of credit control allowing you to send statements, reminder letters and even SMS text messages to your tenants. It is also very useful to keep track of what you owe to your suppliers and when they are due to be paid. The ability to balance your bank accounts would be an extremely useful addition. A diary function or system of reminders is essential. 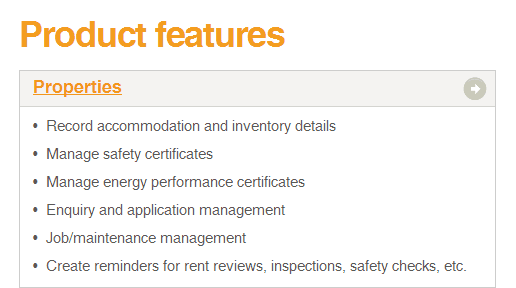 Such a system could tell you when a tenancy will end or when you will need to renew a gas safety certificate. The possible uses are endless! Most software will provide you with plenty of reports that can tell you things like whether a particular property is proving to be profitable or what furniture and fittings are part of the inventory for this or that property. The software should also have the ability to generate standard letters with the tenant’s details already filled in for you. The price of property management software varies considerably and could cost you anything from a couple of hundred pounds to a couple of thousand pounds. If it’s the right software, it will pay for itself over time by providing you with more accurate record keeping and saving you money on your accountant’s bill. Many software suppliers will happily provide you with a demonstration or trial version of their software so that you can try it before you part with your hard-earned cash. Take the time to do this; you may not be able to explore all the features the software has to offer but you will at least be able to get a flavour and know if it is going to be right for your needs. The very nature of software means that you won’t be able to get your money back if you buy the software and then, after using it, decide that you don’t like it. As you can see, a systemized approach to managing your properties and tenants has many benefits and hopefully with the advice given by John for you above you can see if it’s right for you. Personally, I look at the software that we use for my own properties as a way to save us time, but it’s also been a lifesaver with some of its other features. My personal favourite is the ability to print rent statements on demand which details, all charges, payments received, discounts given, dates, tenants details etc…. We’ve had many tenants in the past dispute what rent is owed, but a simple printed off rent statement works wonders for getting them back on track. Personally I would recommend if you have just one rental property that software might be a little overkill, but if your looking to build a portfolio and systemise your business, then it’s essential. I’ve had so many people come to me in the past saying “I’ve been using spreadsheets for the past 2 years but they no longer suffice and I need a better solution!” Spreadsheets are great but it gets a little more complex once you acquire a few more properties! * By submitting your name and email you will be emailed a link and a login to our training platform. You are also agreeing to be sent a weekly email by Property Investments UK containing free property tips and advice. We may also occasionally send you promotions for our products and information about our partners. You can unsubscribe at anytime from within the emails we send. Property investing, like any investment carries risks. It is important to note that results achieved in property or using our training course are atypical and may vary from user to user.